Credit Cards get considered as a convenient method of making financial transactions when used in an ideal way. Do you use HDFC Credit Card? You must have set a credit card limit depending on your financial needs. HDFC Bank offers an array of credit cards designed with different specifications and financial requirements. You can't cross the line of credit. It is easy to increase HDFC Credit Card Limit Online. You need not visit the bank and apply for Limit Enhancement. Any eligible credit card user can increase the Credit Card limit accepting the applicable terms and policies. Apart from extending the card limit, you can also upgrade the card and get access to lots of more features. You need to follow the steps to increase the limit of HDFC Credit Card online. First of all, you must fulfill the eligibility criteria, i.e. you must be using the card for 6-12 months without any issues/default in payments. HDFC Bank informs the eligible customers/card holders via call about the eligibility to increase the credit limit and card upgrade. If you have received the call, you can simply follow the steps online but if you haven't received any such call, visit the official website of HDFC Bank. 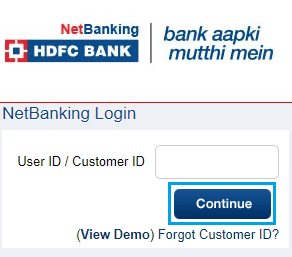 Step 1: Login to your net banking account entering the User ID and Password. Step 2: Click on Cards tab. Step 3: On the left-side menu, click on Request under Credit Card section and select Credit Limit Enhancement under request tab. Select the card number for which you want to extend the credit card limit. Select the card number and click on Continue button. 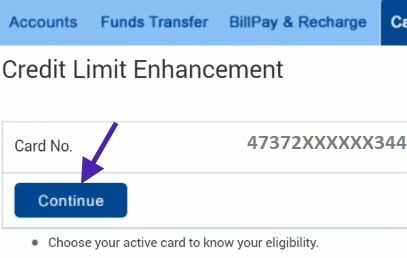 Important Note: If you are not eligible for credit card limit enhancement, just click the blue 'notify me' button. They will send SMS or Email alert once your credit card is eligible for this offer. 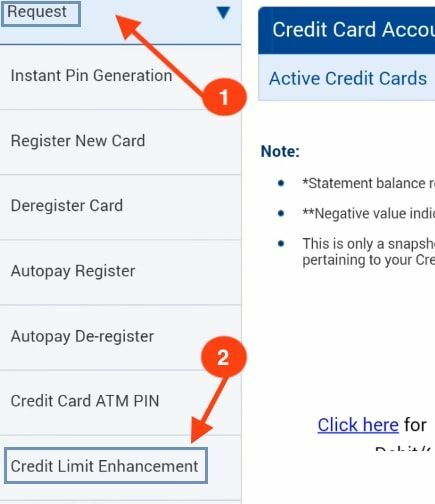 If you are eligible for Limit Enhancement, the screen will display the card number. Follow further steps to complete the whole process. Step 5: On a new page, you will get the card details, i.e. 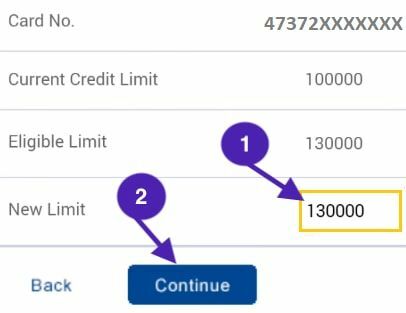 card number, current credit limit, and eligible limit. The page also contains a box in which you need to enter the 'New Limit'. After entering the 'New Limit', click on 'Continue' button. 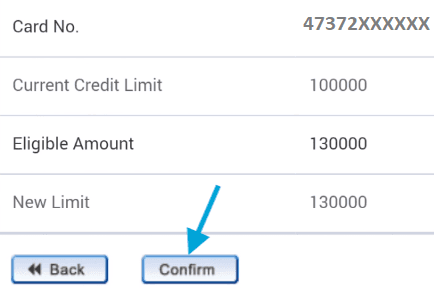 Step 6: Now click on 'Confirm' button if you want to proceed with the new credit limit. Your request for Limit Enhancement will be sent automatically to the bank. You will receive the confirmation message from the bank after successful limit enhancement. You can check the new credit limit for the card by clicking on Account Summary. Note down the reference number to track the status of your request. There are several other ways for credit card limit enhancement but online option is easy. You need not visit the branch or call the customer care or write a letter to the bank which is quite time-consuming.